Knorr-Bremse CVS - The Knorr-Bremse Group in Germany. The Knorr-Bremse Group in Germany. This is where our roots lie. 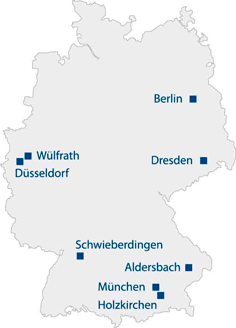 The Knorr-Bremse Group employs some 4,800 people in Germany. Today&apos;s company headquarters are located in Munich, the company was founded in Berlin in 1905 by Georg Knorr. Click on the desired location on the map to see the address and contact data and the how-to-find-us information.